Staff at the newly transformed Ozzie Owls room at St Oswald's CE VA Primary School in Hebburn. A South Tyneside school is celebrating the launch of a new-look care facility. St Oswald’s CE VA Primary School in Hebburn has officially opened its new out of school hours provision for youngsters. Youngsters tuck into snacks in the new Ozzie Owls room. The primary held a celebration morning to unveil the newly revamped Ozzie Owls Wrap Around Care Provision, providing before and after school care, which has been created in the school’s Mary Thomas Room. Headteacher at the St Oswald’s Road school, Helen Smith, said the whole school, as well as the community, will benefit from the transformation of the room. 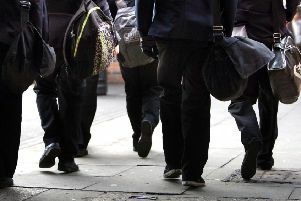 She said: “School have kept a separate budget for the provision and spent almost £10,000 providing new flooring, furniture, decor, computing equipment and kitchen. South Tyneside Councillor Adam Ellison, who is also chairman of governors at the primary school, went along to perform the opening ceremony. Parents and children were also invited to attend and were treated to sausage and bacon rolls at the breakfast-time event. Ms Smith, said: “The Ozzie Owls provision will not only benefit the children who access wrap-around care, but also the rest of the school community.